Buttons proclaiming “Bloomberg in 2008” will not go to waste. They are part of a new exhibit at the Museum of the City of New York, focused on the city's role in the outcome of presidential elections. The buttons, collected by the late Jordan Wright from the time he was a 10-year old, sparked the idea for this historic and timely show. At the display's center sits a lectern in a plexi-glass case lent by the Great Hall at Cooper Union, where Abraham Lincoln had delivered a key speech. Standing in his place, one has a view of cardboard life sized figures of Barack Obama, Hillary Clinton, and John McCain seeming to listen. 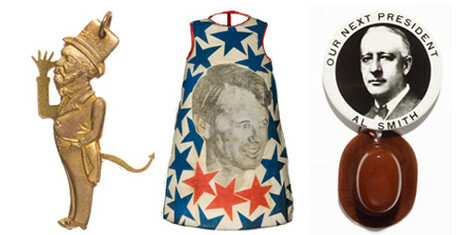 “I Like Ike” socks, a stars and stripes Robert Kennedy for president paper mini dress, and Richard Nixon Good Humor bar wrappers all remind visitors of the whimsy behind the serious business of the elections. At the opening on Monday, Mayor Bloomberg assured the crowd that he did not attend this celebration of presidential memorabilia to endorse a candidate for the upcoming election of the 44th U.S. president, but for the 45th. And then he introduced Ed Koch who took the podium to say, of course it is better to win than to lose, but the people who worked on Hillary Clinton's efforts to become president will never forget the experience. His message: get involved. Get out and work for your candidate. Do you know that it's the best time to receive the business loans, which will help you. That's good that people can get the mortgage loans and that opens completely new opportunities.